I’ve officially turned the corner…fall and Thanksgiving are finished and it’s time to move on to Christmas! I thought I would start out with some very easy Christmas decorating ideas. 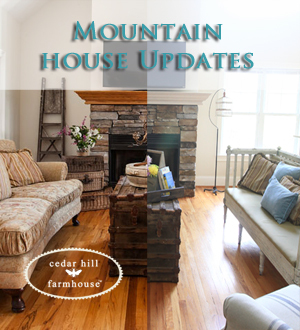 Inspiration that you can use to make something old look new again and reflect your own personal style. We can’t start over from scratch (no matter how much we would like to) so the challenge is refreshing what we already have. I always end up buying a few new things…I splurged and bought us new stockings this year…but most of what you will see in 2016 has been seen before. 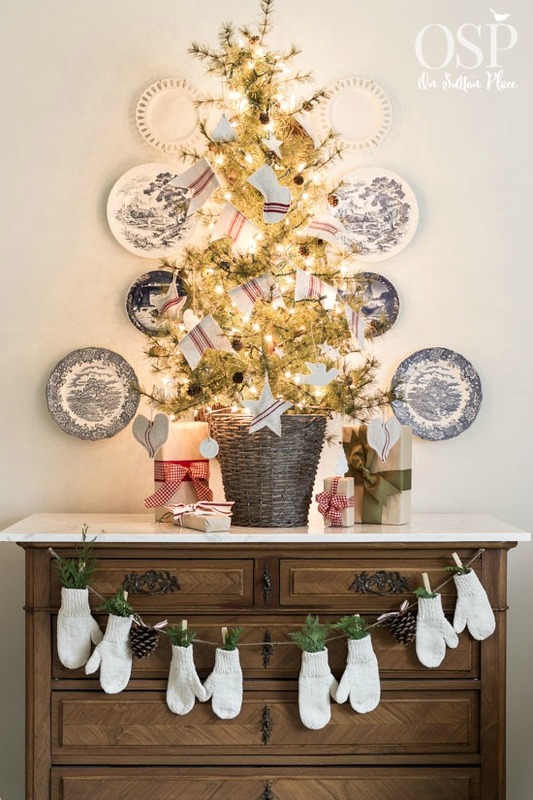 Hopefully, we can make our things look fresh, festive & fun…so on to the tips and ideas! Natural elements are my favorite kind of decor any time of the year, but especially at Christmas. Sometimes you can get them for free. If you are lucky enough to have pine trees or boxwood planted in your yard, just head outside and start snipping. Make your own garlands or wreaths. Fill pitchers and jars to set around your home. Don’t limit yourself to just greenery. Here is a list of other types of natural elements that work with any style decor and almost any budget. Fresh greenery – pine, boxwood, juniper, cedar or the ultimate in fresh greenery…Leyland cypress. Tie it around candles or pitcher handles. Tie it to the top of lanterns or on basket handles. Add ribbon around pots or urns. Stack your flatware and tie a ribbon around it. Candles are the easiest way to add softness to any space. Their soft glow adds warmth too and just makes you feel cozy. If you choose scented candles, you have the added bonus of aromatherapy. Candles can be grouped together to make an easy centerpiece or coffee table arrangement. Vary the heights and add some filler around them to really make a statement. 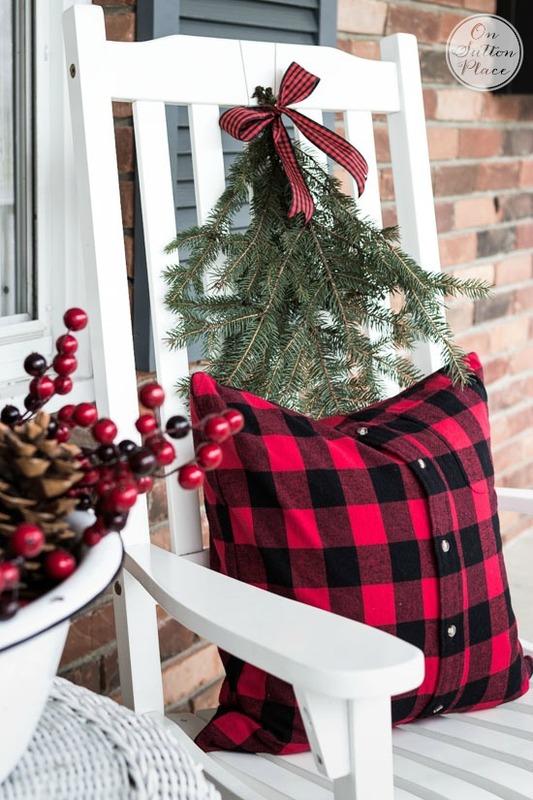 A list of easy Christmas decorating ideas wouldn’t be complete without the mention of pillows and throws. What could be easier? 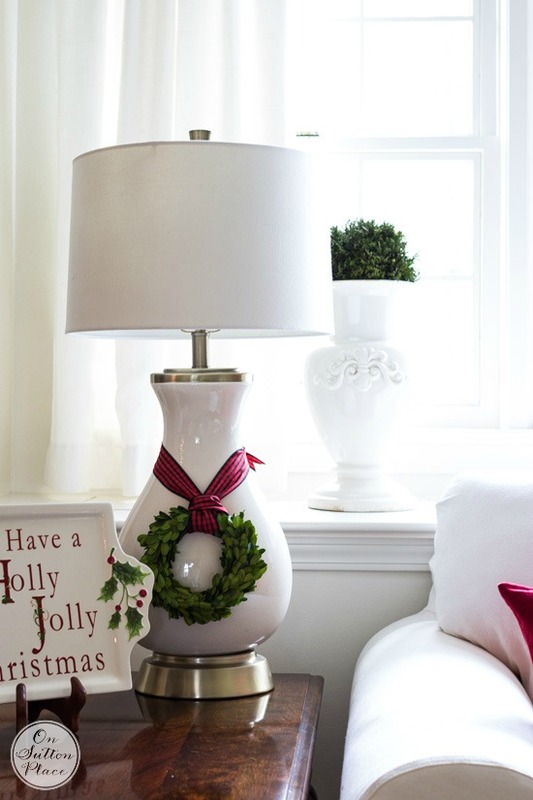 There are so many holiday designs to choose from in all price ranges…or go with solid red. Several years ago I picked up two red velvet pillow covers at IKEA. I got them without really knowing what I would do with them…and they have turned out to be the best thing ever. I use them every year at Christmas. They have moved around but I always find a place for them. Not sure where they will land this year but rest assured they will pop up! Click HERE if you want to take a look at a Holiday Shopping Guide I made featuring red throws. Here are all the free Christmas printables available so far on my blog. I’ve been making them for a few years now and the collection is growing. They make great, free DIY wall art or you can use them for cards and banners. I was inspired by your white bowl filled with pine cones that you have on your porch. I filled a big white bowl (Threshold from Target) with a mix of pine cones, pods, berrys, etc. I quite happy with it! I’ll be decorating a large white lantern, as well! Thank you! Love your style. Thanks for the great ideas! 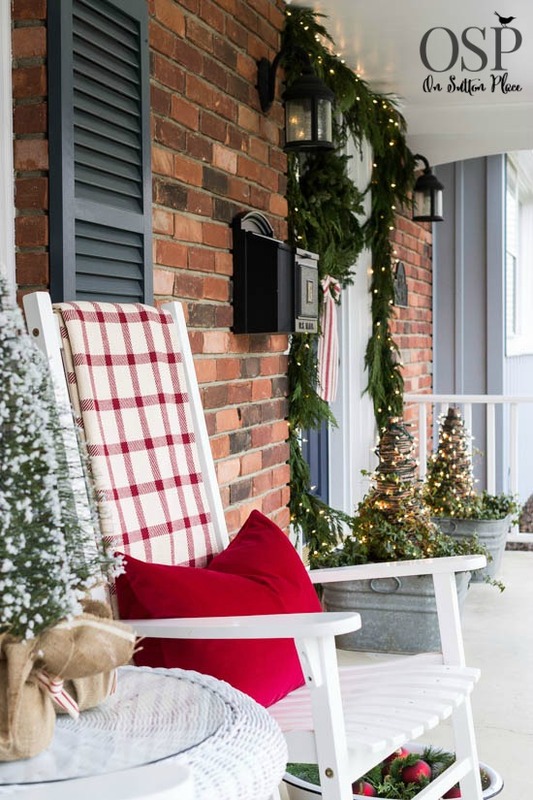 Love your site especially the fall and Christmas outside decor. So I found some olive buckets!! I love the fall look and now I’m on to get the same kind of look for Christmas. Did you post pics of the olive buckets with your mini Christmas trees in them or not? I thought I had seen them used that way too. But upon looking back at the Christmas outdoor diy above I only see the galvinized buckets used there. So, my question would be about the grapevines placed on top of the buckets. Would you do that for the Christmas decor and put a live tree or a grapevine tree inside the buckets. Just need a little guidance. I don’t have mini trees, fake, grapevine or real yet. Deciding which way to go. Thx! I just put a garden pot upside down in the olive buckets and set the trees on them. The trees were live, cut trees from Lowe’s that already had a stand attached. You could do the same thing with grapevine trees or really any other type of tree. You just need a riser inside the olive bucket. Hope this helps! Thanks for helping me remember where I saw the other pic of your buckets with trees!! 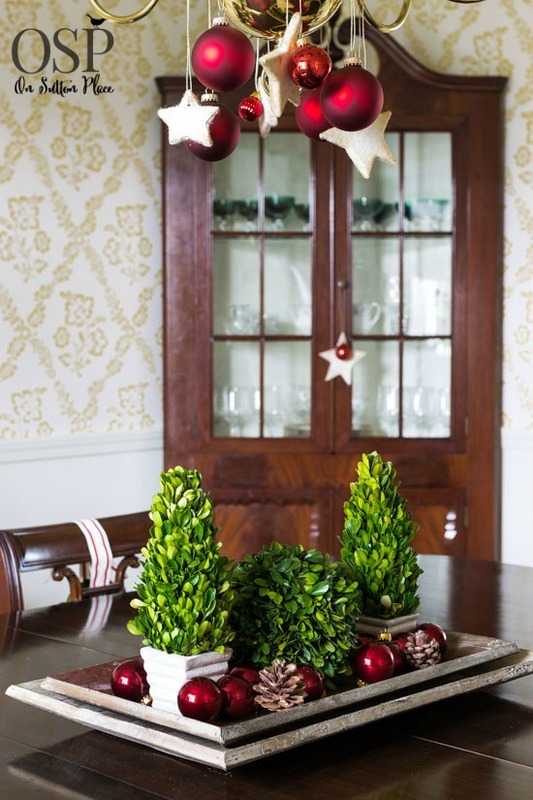 Such beautiful simple ways to add Christmas decor and I love your printables Ann!! OMGosh you have some amazing ideas on your site. Sad I live in a one bed flat. You are so talented thank you for sharing. Ann, thank you so much for these beautiful printables! 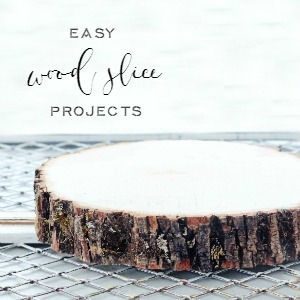 I can’t wait to get started on my Christmas projects after viewing this post. You’re the best! Looks very festive! 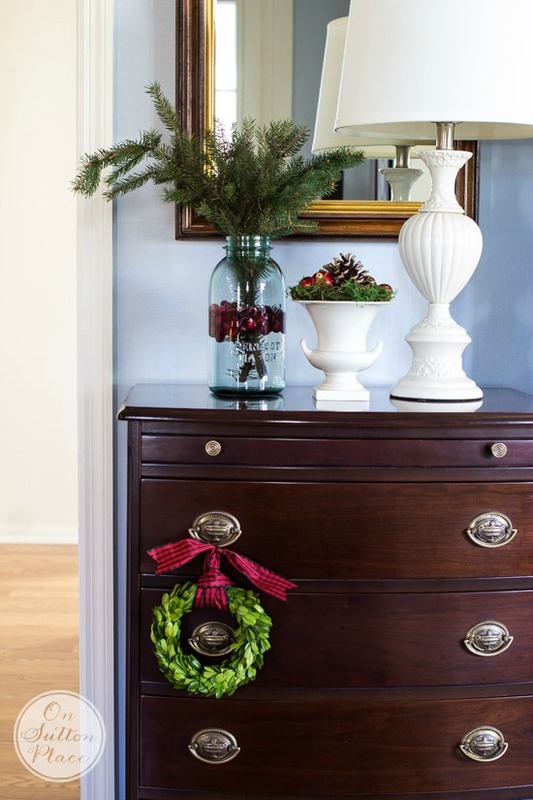 Where might I purchase the small box wood wreaths that are on the lamp, hall table, and china cabinet? Thanks. Looks so very festive! Where might I purchase the small box wood wreaths that are on the lamp and end table? Thanks. Great ideas. Your home is so lovely. You always have the best ideas, Ann! Everything looks so nice and I especially love the mitten banner. It is just so cute! Thanks for the inspiration. I love how you hang little wreaths here and there. So many cute ideas! I love using anything boxwood, so thanks for that inspiration. The mitten garland is adorable and I will probably find somewhere it needs to go! love to make wreaths for our door and I am going with my daughter this weekend to pick up everything I need to make the snowman wreath, so adorable. Oh, and your lanterns are so pretty. I have a lantern I bought from Pottery Barn a few years ago and always bring it to life over the holidays. I especially love your white lanterns. As always, have a blessed day to you and all your subscribers. Love all the ideas, the stars and red ormentes is really cute. All great easy, inexpensive ideas. This year I’m going go make a banner using dollar store Christmas socks, maybe putting evergreen or candy canes peeking out of some of the socks. So many great ideas. The one that really grabbed my attention is those adorable mittens hung from twine – cute enough for me to wish I could knit my own little mittens!! I’ll have to see if I can come up with some that look hand knit. I love your Website. I love all the Holidays and ideas that you share. Thanks, Ann. Ann, I just love your decor. I am finding that I appreciate the natural decor more than ever before. It’s just so pretty! You have outdone yourself with your first Christmas post. Everything is just beautiful. I love ribbon, too, and always load up when it goes on sale for 50% off. Or buy it for $1.00 a roll on clearance after a holiday. I can’t tell you how much I enjoy your blog and thank you so much for sharing your home and your creativity with all of us. Oh my……I love it all, simple, festive, easy to accomplish and beautiful. 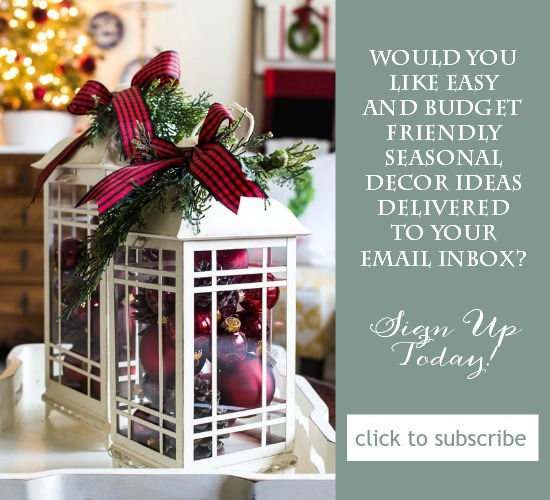 I don’t start decorating till after Thanksgiving but I am not a blogger……but I will be coming back to this e-mail often in the next few weeks, watching for good buys and gathering materials to make this happen after my family leaves me the Sunday after T-giving! Thank you Ann!!!!! Thank you for these amazing decorating ideas. I love them all. They are for Christmas, but also celebrate winter and I would leave many of them up throughout those cold dreary months ahead. Your website is the best! I like your lanterns with the bows and balls inside. I have a lantern that I am going to try to make like yours. Also thank you for the other ideas. 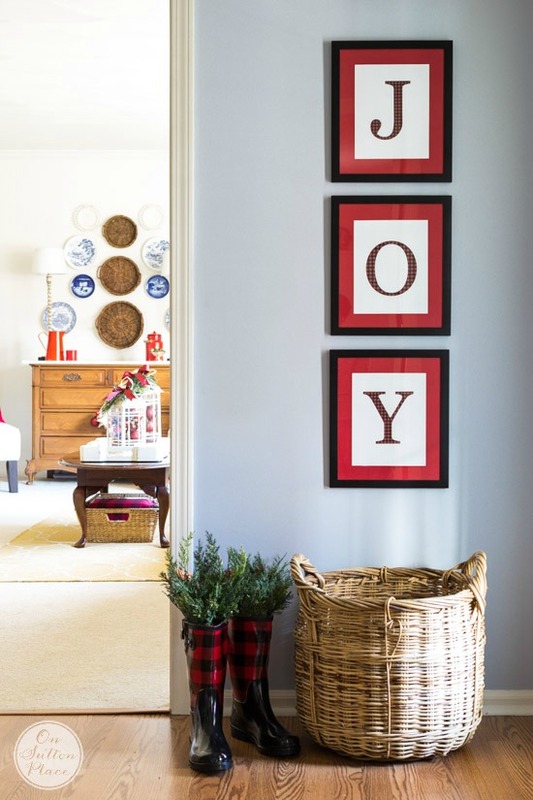 Ann — this is such a practical and useful entry for creative decorating approaches! Thank you so much!!! Just love your style…Thank you!! Your post today comes at just the right time for me. 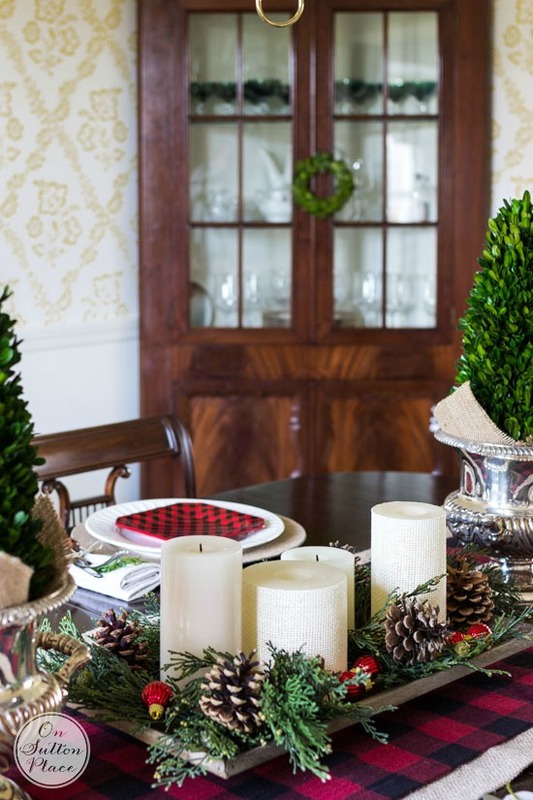 I am hosting a Christmas party the first weekend in December & I have been giving a lot of thought as to how to decorate simply because it’s so early in the season. Once again you have gotten my creative juices going! You have given me some ideas that are simple to accomplish & elegant. I know exactly what I’m going to do now! Thank you! Very pretty. I need to clean off the dining room table from making my gifts to family and friends so I can make it pretty. I love the calming simplicity of your Christmas decor. I’ve been looking for small faux boxwood wreaths, like the ones in your photos, since last year. Every time I find some online they are already sold out. Where did you get yours? Thanks! Did you try Ballard Designs? We purchased ours there last year and we were very happy with them. Everything you do is so well done and so my taste! Love it! Good morning Ann, you have just the right touch in decorating your home in any season. I love your color theme too, a beautiful cohesive look.